If you’ve been looking for a pre-owned car around Mechanicstown, visit Middletown Honda for a used Honda Accord. We’re just a short drive from Mechanicstown, and in addition to our brand new Honda stock, we also carry a variety of pre-owned models, including the Accord. 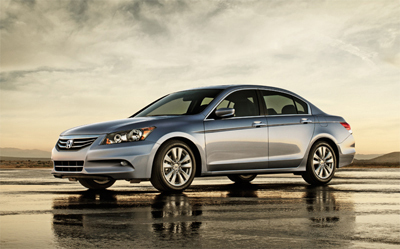 Few cars can compare to the Accord when it comes to versatility. It’s a great midsize sedan for practically any kind of driver: well-equipped, dependable, and easily affordable. Recent years have pushed the Accord into one of the top-selling vehicles on the market, and it’s easy to see why, but there have been great reasons to buy an Accord for decades now. Let’s take a look at some of the features you may find in recent pre-owned Accord models. As if that weren’t enough, you have two body styles to choose from: coupe or sedan. And then there are the hybrid options. The 2014 model year saw a plug-in hybrid as well as a traditional model, giving options for the fuel-conscious driver. Although the ninth generation had something to say about the way we look at standard features, the eight generation of the Accord is still impressive. By the end of the generation, vehicles included amenities such as cruise control, full power accessories, iPod/USB interface, and more, with optional add-ons like Bluetooth and an audio system upgrade. The Accord has always been known as a fuel efficient sedan, but for drivers seeking a bit more power than the four-cylinder standard engine, Honda offered a V6 with 271 hp and 264 lb-ft of torque. Whether brand new or gently used, the Accord has always been a great choice for Mechanicstown and Middletown drivers. Contact Middletown Honda today to take one of our pre-owned Accord models for a test drive. We can’t wait to see you at our dealership, located at 520 Route 211 East.